Perhaps the most surprising poem of the selection, ‘Calligram’ selects a famous French poet’s avant-garde poetry that uses calligrams to help describe the world at war. Calligrams are poems that use words and letters to create pictures that are related to the subject or theme of the poem. STRUCTURE NOTE: This is an example of free verse. The poem is simple yet striking. Two couplets head the poem. The first couplet writes of the sky over all; the second couplet describes a shell flying over the poet’s head as he writes. Underneath these, there is first the calligram of a five pointed star, then underneath that, a calligram of an artillery gun. So the poem does, to a degree, recreate the scene of war in words and ink, on a page. Guillame Apollinaire: Apollinaire was an early French surrealist— in fact, he coined the term, ‘surrealism’. He was an experimentalist in art and poetry. 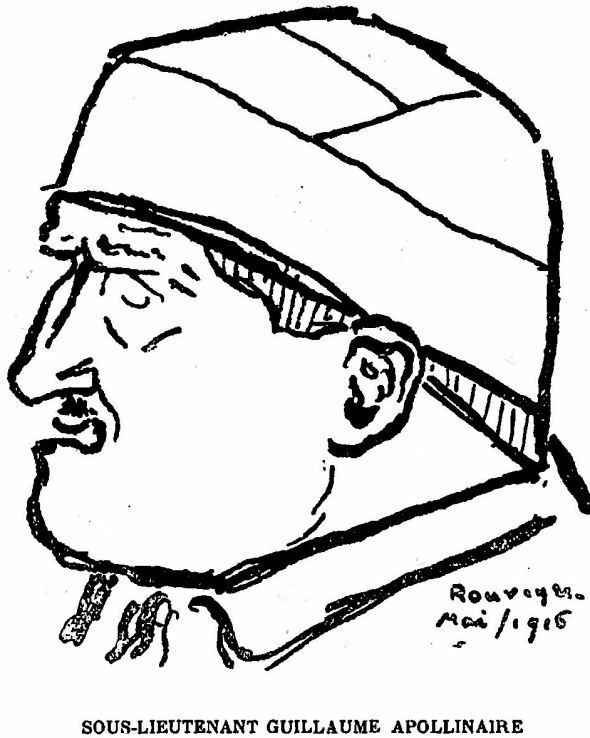 In combat in 1916, Apollinaire received a head injury which was operated on successfully (see illustration!). He survived the war, sadly to be one of the tens of millions who died in the Spanish flu pandemic of 1918. Calligram, 15 May 1915: A precise date for the creation of the poem: Apollinaire was at this time in the French army. “The sky’s as blue and black as ink…”: The opening simile is self-referential, referring to its means of composition— in ink. Parallels are being drawn between the written page and the world itself. “My eyes drown in it…”: Again, the intensity of the sky, and the act of writing, are linked: his eyes drown in the sky, and also drown in ink. “A shell whines over me”: This poem relates action on the Western Front. “I write this under a willow tree…”: symbolism: the weeping willow symbolizes sadness. “The evening star a punctual gem shines like a rajah’s diadem…”: The evening star is Venus, the planet of love. It is a timely (punctual) thing of beauty and value above this scene of war and misery, shining like a gem in an Indian King’s crown.